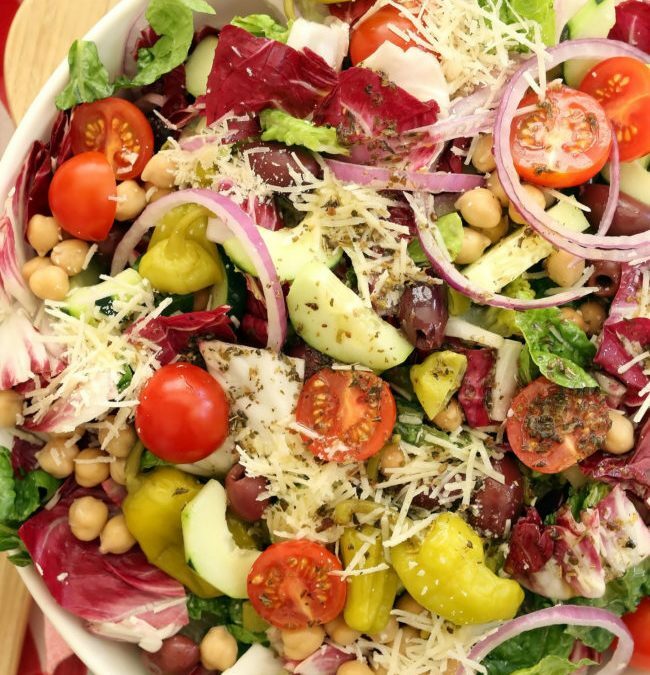 This Italian Chopped Salad is a quintessential chopped salad that’s loaded with flavor and a delicious combo of ingredients. It’s great to serve with any Italian dish, grilled chicken or salmon, yet filling enough to be a meal on its own. Perfect for warm summer nights, backyard barbecues and potlucks. Slice the layers of onions lengthwise 1/16 inch thick. Place the onion slices in a small bowl of ice water and set aside. Drain the onion and pat dry with paper towels before adding them to the salad. Thinly slice the lettuce and radicchio. In a large bowl, combine the lettuce, radicchio, tomatoes, cucumber, garbanzo beans, cheese, , peperoncini, and onion slices. Toss to thoroughly combine the ingredients. Drizzle 1/2 cup of the vinaigrette and the juice of the lemon over the salad, then toss gently to coat the salad with the dressing. Taste for seasoning and add more lemon juice, or vinaigrette if desired. Sprinkle with extra oregano and serve. Combine the vinegar, oregano, lemon juice, garlic, kalamata olives, Parmesan cheese, and pepper in a medium bowl and whisk to combine the ingredients. Set aside for 5 minutes to marinate the oregano and basil. Add the olive oil in a slow thin stream, whisking constantly to combine. You can also add all the ingredients to a glass jar with a lid and shake to combine.